:" .i i i t i..-. ■. f.'n m Í-xu-l^iiL1 tt_i:T.rr.r-r: Wot. Probably the illustrated suite of furniture at Penshurst Place, which comprises thirteen pieces, was imported about this time; two of the smaller chairs appear to have their original cushions, the others have been lately re-covered by Lord de l'Isle and Dudley. The spindles of the backs of two of the chairs are of ivory: the carving, which is in solid ebony, is much finer on some than on others. "It is as noble and uniform a pile as Gothic architecture can make it. There is incomparable furniture in it, especially hangings designed by Raphael, very rich with gold. Of the tapestries I believe the world can show nothing nobler of the kind than the stories of Abraham and Tobit.11 ... The Queen's bed was an embroidery of silver on crimson velvet, and cost £8,000, being a present made by the States of Holland when his majesty returned. The great looking-glass and toilet of beaten massive gold were given by the Queen Mother. The Queen brought over with her from Portugal such Indian cabinets as had never before been seen here." Evelyn wrote of course before Wren made his Renaissance additions to the Palace. After the great fire which occurred in 1666, and destroyed some 13,000 houses and no less than 80 churches, Sir Christopher Wren was given an opportunity, unprecedented in history, of displaying his power of design and reconstruction. Writing of this great architect, Macaulay says, "The austere beauty of the Athenian portico, the gloomy sublimity of the Gothic arcade, he was, like most of his contemporaries, incapable of emulating, and perhaps incapable of appreciating; but no man born on our side of the Alps has imitated with so much success the magnificence of the palace churches of Italy. Even the superb Louis XIV. has left to posterity no work which can bear a comparison with St. Paul's." XIV. ; the Fountain Court at Hampton being in direct imitation of the Palace of Versailles. SbDizS BUS Bl AN A "
from e. Print in the posmsikiii of J. C, Thykke, Eh^. The carved woodwork of the choir of St. Paul's, with fluted columns supporting a carved frieze; the richly carved panels, and the beautiful figure work on both organ lofts, afford evidence that the oak enrichments followed the marble and stone ornament. The swags of fruit and flowers, the cherubs' heads with folded wings, and other details in Wren's work, closely resemble the designs executed by Gibbons, whose carving is referred to later on. It may be mentioned here that amongst the few churches in the city which escaped the great fire, and contain woodwork of particular note, are St. Helen's, Bishopgate, and the Charterhouse Chapel, which contain the original pulpits of about the sixteenth century. The famous Dr. Busby, who for 55 years was head master of Westminster School, was a great favourite of King Charles, and a picture painted by Sir Peter Lely, is said to have been presented to the Doctor by His Majesty; it is called "Sedes Busbiana." Prints from this old picture are scarce, and the writer is indebted to Mr. John C. Thynne for the loan of his copy, from which the illustration is taken. The portrait in the centre, of the Pedagogue aspiring to the mitre, is that of Dr. South, who succeeded Busby, and whose monument in Westminster Abbey is next to his. The illustration is interesting, as although it may not have been actually taken from a chair itself, it shews a design in the mind of a contemporary artist. Of the Halls of the City Guilds, there is none more quaint, and in greater contrast to the bustle of the neighbourhood, than the Hall of the Brewers' Company, in Addle Street, City. This was partially destroyed, like most of the older Halls, by the Great Fire, but was one of the first to be restored and refurnished. In the kitchen are still to be seen the remains of an old trestle and other relics of an earlier period, but the hall or dining room, and the Court room, are complete, with very slight additions, since the date of their interior equipment in 1670 to 1673. The Court room has a richly carved chimney-piece in oak, nearly black with age, the design of which is a shield with a winged head, palms, and swags of fruit and flowers, while on the shield itself is an inscription, stating that this room was wainscoted by Alderman Knight, master of the Company and Lord Mayor of the City of London, in the year 1670. The room itself is exceedingly quaint, with its high wainscoting and windows on the opposite side to the fireplace, reminding one of the port-holes of a ship's cabin, while the chief window looks out on to the old-fashioned garden, giving the beholder altogether a pleasing illusion, carrying him back to the days of Charles II. The chief room or Hall is still more handsomely decorated with carved oak of this time. The actual date, 1673, is over the doorway on a tablet which bears the names, in the letters of the period, of the master, "James Reading, Esq.," and the wardens, "Mr. Robert Lawrence," "Mr. Samuel Barber," and "Mr. Henry Sell." The names of other masters and wardens are also written over the carved escutcheons of their different arms, and the whole room is one of the best specimens in existence of the oak carving of this date. 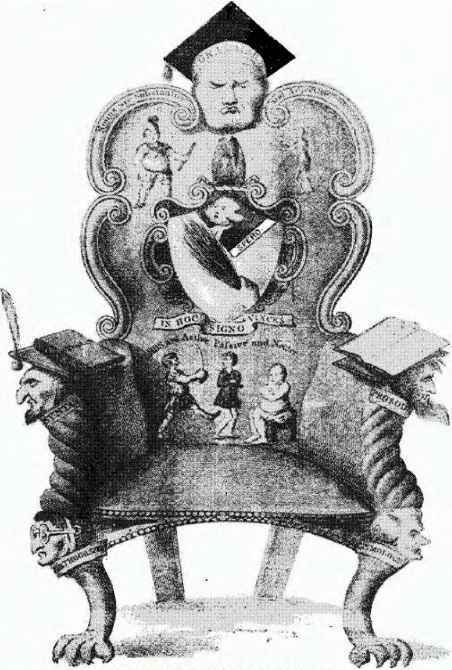 At the western end is the master's chair, of which by the courtesy of Mr. Higgins, clerk to the Company, we are able to give an illustration on p. 115—the shield-shaped back, the carved drapery, and the coat-of-arms with the company's motto, are all characteristic features, as are also the Corinthian columns and arched pediments, in the oak decoration of the room. The broken swan-necked pediment, which surmounts the cornice of the room over the chair, is probably a more recent addition, this ornament having come in about 30 years later. There are also the old dining tables and benches; these are as plain and simple as possible. In the court room, is a table, which was formerly in the Company's barge, with some good inlaid work in the arcading which connects the two end standards, and some old carved lions' feet; the top and other parts have been renewed. There is also an old oak fire-screen of about the end of the seventeenth century. Another city hall, the interior woodwork of which dates from just after the Great Fire, is that of the Stationers' Company, in Ave Maria Lane, close to Ludgate Hill. Mr. Charles Robert Rivington, the present clerk to the Company, has written a pamphlet, full of very interesting records of this ancient and worshipful corporation, from which the following paragraph is a quotation:—"The first meeting of the court after the fire was held at Cook's Hall, and the subsequent courts, until the hall was re-built, at the Lame Hospital Hall, i.e., St. Bartholomew's Hospital. In 1670 a committee was appointed to re-build the hall; and in 1674 the Court agreed with Stephen Colledge (the famous Protestant joiner, who was afterwards hanged at Oxford in 1681) to wainscot the hall 'with well-seasoned and well-matched wainscot, according to a model delivered in for the sum of £300.' His work is now to be seen in excellent condition." Mr. Rivington read his paper to the London and Middlesex Archaeological Society in 1881; and the writer can with pleasure confirm the statement as to the condition, in 1892, of this fine specimen of seventeenth century work. 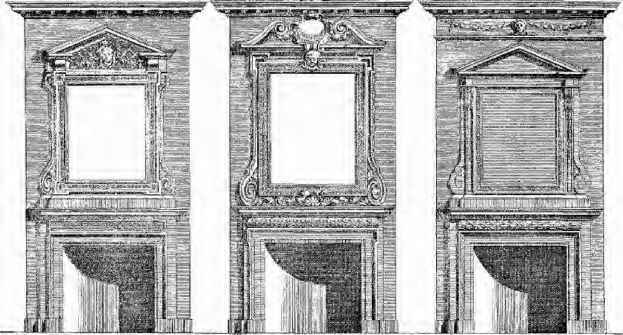 Less ornate and elaborate than the Brewers' Hall, the panels are only slightly relieved with carved mouldings; but the end of the room, or main entrance, opposite the place of the old dai's (long since removed), is somewhat similar to the Brewers', and presents a fine architectural effect, which will be observed in the illustration on p. 117. 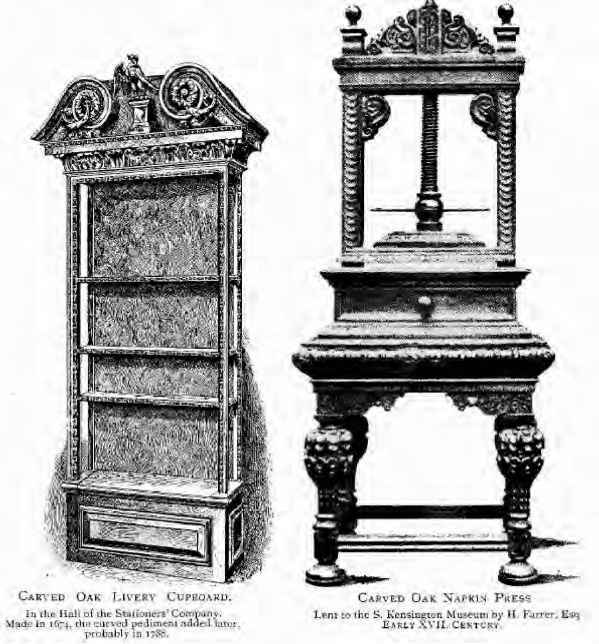 There is above, an illustration of one of the two livery cupboards, which formerly stood on the dai's, and these are good examples of the cupboards for display of plate of this period. The lower part was formerly the receptacle of unused viands, distributed to the poor after the feast. In their original state these livery cupboards finished with a straight cornice, the broken pediments with the eagle (the Company's crest) having most probably been added when the hall was, to quote an inscription on a shield, "repaired and beautified in the mayoralty of the Right Honourable William Gill, in the year 1788," when Mr. Thomas Hooke was master, and Mr. Field and Mr. Rivington (the present clerk's grandfather) wardens. There is still preserved in a lumber room one of the old benches of seventeenth century work—now replaced in the hall by modern folding chairs. This is of oak, with turned skittle-shaped legs slanting outwards, and connected and strengthened by plain stretchers. The old tables are still in their places. Another example of seventeenth century oak panelling is the handsome chapel of the Mercers' Hall—the only city Company possessing their own chapel—but only the lining of the walls and the reredos are of the original work, the remainder having been added some ten or twelve years ago, when some of the original carving was made use of in the new work. Indeed, in this magnificent hall, about the most spacious of the old City Corporation Palaces, there is a great deal of new work mixed with old—new chimney-pieces and old overmantels—some of Grinling Gibbons' carved enrichments, so painted and varnished as to have lost much of their character; these have been applied to the oak panels in the large dining hall. HAMI-TOR COLKT PAJ.ACE, HAUDWIGlt IJttL. KnCILF, SjiVEKOAKS. The woodwork lining of living rooms had been undergoing changes since the commencement of the period of which we are now writing. In 1638 a man named Christopher had taken out a patent for enamelling and gilding leather, which was used as a wall decoration over the oak panelling. This decorated leather hitherto had been imported from Holland and Spain; when this was not used, and tapestry, which was very expensive, was not obtainable, the plaster was roughly ornamented. Somewhat later than this, pictures were let into the wainscot to form part of the decoration, for in 1669 Evelyn, when writing of the house of the "Earle of Norwich," in Epping Forest, says, "A good many pictures put into the wainstcot which Mr. Baker, his lordship's predecessor, brought from Spaine." Indeed, subsequently the wainscot became simply the frame for pictures, and we have the same writer deploring the disuse of timber, and expressing his opinion that a sumptuary law ought to be passed to restore the "ancient use of timber." Although no law was enacted on the subject, yet, some twenty years later, the whirligig of fashion brought about the revival of the custom of lining rooms with oak panelling. It is said that about 1670 Evelyn found Grinling Gibbons in a small thatched house on the outskirts of Deptford, and introduced him to the King, who gave him an appointment on the Board of Works, and patronised him with extensive orders. The character of his carving is well known; generally using lime-tree as the vehicle of his designs, the life-like birds and flowers, the groups of fruit, and heads of cherubs, are easily recognised. One of the rooms in Windsor Castle is decorated with the work of his chisel, which can also be seen in St. Paul's Cathedral, Hampton Court Palace, Chatsworth, Burleigh, and perhaps his best, at Petworth House, in Sussex. He also sculptured in stone. The base of King Charles' statue at Windsor, the font of St. James', Piccadilly (round the base of which are figures of Adam and Eve), are his work, as is also the lime-tree border of festoon work over the communion table. Gibbons was an Englishman, but appears to have spent his boyhood in Holland, where he was christened "Grinling." He died in 1721. His pupils were Samuel Watson, a Derbyshire man, who did much of the carved work at Chatsworth, Drevot of Brussels, and Lawreans of Mechlin. Gibbons and his pupils founded a school of carving in England which has been continued tradition to the present day. A somewhat important immigration of French workmen occurred about this time owing to the persecutions of Protestants in France, which followed, the revocation of the Edict of Nantes in 1685, by Louis XIV., and these refugees bringing with them their skill, their patterns and ideas, influenced the carving of our frames and the designs of some of our furniture. This influence is to be traced in some of the contents of Hampton Court Palace, particularly in the carved and gilt centre tables and the torchères of French design but of English workmanship. It is said that no less than 50,000 families left France, some thousands of whom belonged to the industrial classes, and settled in England and Germany, where their descendants still remain. They introduced the manufacture of crystal chandeliers, and founded our Spitalfields silk industry and other trades, till then little practised in England. The beautiful silver furniture at Knole belongs to this time, having been made for one of the Earls of Dorset, in the reign of James II. The illustration is from a photograph taken by Mr. Corke, of Sevenoaks. Electrotypes of the originals are in the South Kensington Museum. 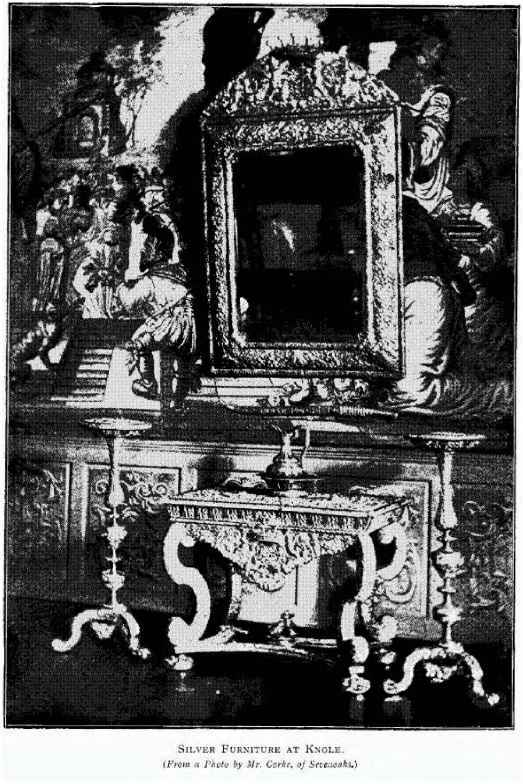 From two other suites at Knole, consisting of a looking glass, a table, and a pair of torchères, in the one case of plain walnut wood, and in the other of ebony with silver mountings, it would appear that a toilet suite of furniture of the time of James II. generally consisted of articles of a similar character, more or less costly, according to circumstances. The silver table bears the English Hall mark of the reign. As we approach the end of the seventeenth century and examine specimens of English furniture about 1680 to 1700, we find a marked Flemish influence. The Stadtholder, King William III., with his Dutch friends, imported many of their household goods12, and our English craftsmen seem to have copied these very closely. 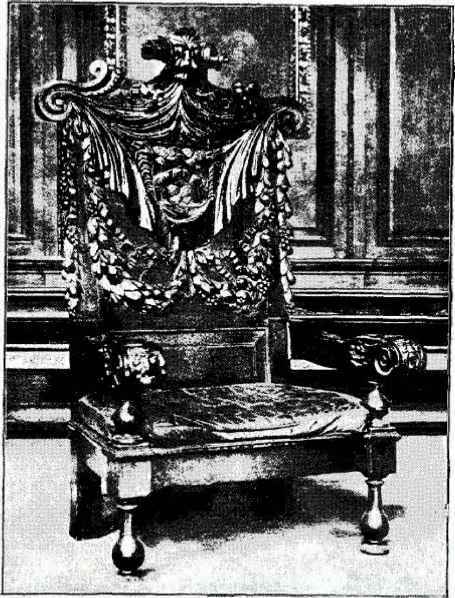 The chairs and settees in the South Kensington Museum, and at Hampton Court Palace, have the shaped back with a wide inlaid or carved upright bar, the cabriole leg and the carved shell ornament on the knee of the leg, and on the top of the back, which are still to be seen in many of the old Dutch houses. There are a few examples of furniture of this date, which it is almost impossible to distinguish from Flemish, but in some others there is a characteristic decoration in marqueterie, which may be described as a seaweed scroll in holly or box wood, inlaid on a pale walnut ground, a good example of which is to be seen in the upright "grandfather's clock" in the South Kensington Museum, the effect being a pleasing harmony of colour. In the same collection there is also a walnut wood centre table, dating from about 1700, which has twisted legs and a stretcher, the top being inlaid with intersecting circles relieved by the inlay of some stars in ivory. As we have observed with regard to French furniture of this time, mirrors came more generally into use, and the frames were both carved and inlaid. There are several of these at Hampton Court Palace, all with bevelled edged plate glass; some have frames entirely of glass, the short lengths which make the frame, having in some cases the joints covered by rosettes of blue glass, and in others a narrow moulding of gilt work on each side of the frame. In one room (the Queen's Gallery) the frames are painted in colors and relieved by a little gilding. The taste for importing old Dutch furniture, also lacquer cabinets from Japan, not only gave relief to the appearance of a well furnished apartment of this time, but also brought new ideas to our designers and workmen. Our collectors, too, were at this time appreciating the Oriental china, both blue and white, and colored, which had a good market in Holland, so that with the excellent silversmith's work then obtainable, it was possible in the time of William and Mary to arrange a room with more artistic effect than at an earlier period, when the tapestry and panelling of the walls, a table, the livery cupboard previously described, and some three or four chairs, had formed almost the whole furniture of reception rooms. The first mention of corner cupboards appears to have been made in an advertisement of a Dutch joiner in "The Postman" of March 8th, 1711; these cupboards, with their carved pediments being part of the modern fittings of a room in the time of Queen Anne. In the latter half of the eighteenth century those convenient pieces of furniture came into more general use, and illustrations of them as designed and made by Chippendale and his contemporaries will be found in the chapter dealing with that period. Dr. Lyon also quotes from an American newspaper, "The Boston News Letter" of April 16th, 1716, an advertisement which was evidently published when the tall clocks, which we now call "grandfathers' clocks," were a novelty, and as such were being introduced to the American public. We have already referred to one of these which is in the South Kensington Museum, date 1700, and no doubt the manufacture of similar ones became more general during the first years of the eighteenth century. The advertisement alluded to runs, "Lately come from London, a parcel of very fine clocks—they go a week and repeat the hour when pulled" (a string caused the same action as the pressing of the handle of a repeating watch) "in Japan cases or wall-nut." The style of decoration in furniture and woodwork which we recognise as "Queen Anne," apart from the marqueterie just described, appears, so far as the writer's investigations have gone, to be due to the designs of some eminent architects of the time. Sir James Vanbrugh was building Blenheim Palace for the Queen's victorious general, and also Castle Howard. Nicholas Hawksmoor had erected St. George's. Bloomsbury, and James Gibbs, a Scotch architect and antiquary, St. Martin's-in-the-Fields, and the Royal Library at Oxford; a ponderous style characterises the woodwork interior of these buildings. We give an illustration of three designs for chimney-pieces and overmantels by James Gibbs, the centre one of which illustrates the curved or "swan-necked" pediment, which became a favourite ornament about this time, until supplanted by the heavier triangular pediment which came in with "the Georges." The contents of Hampton Court Palace afford evidence of the transition which the design of woodwork and furniture has undergone from the time of William III. until that of George II. 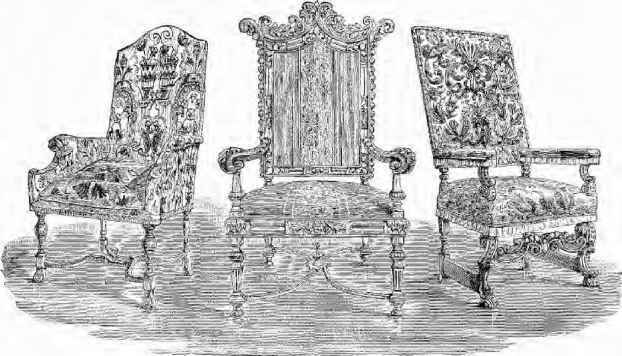 There is the Dutch chair with cabriole leg, the plain walnut card table also of Dutch design, which probably came over with the Stadtholder; then, there are the heavy draperies, and chairs almost completely covered by Spitalfields silk velvet, to be seen in the bedroom furniture of Queen Anne. 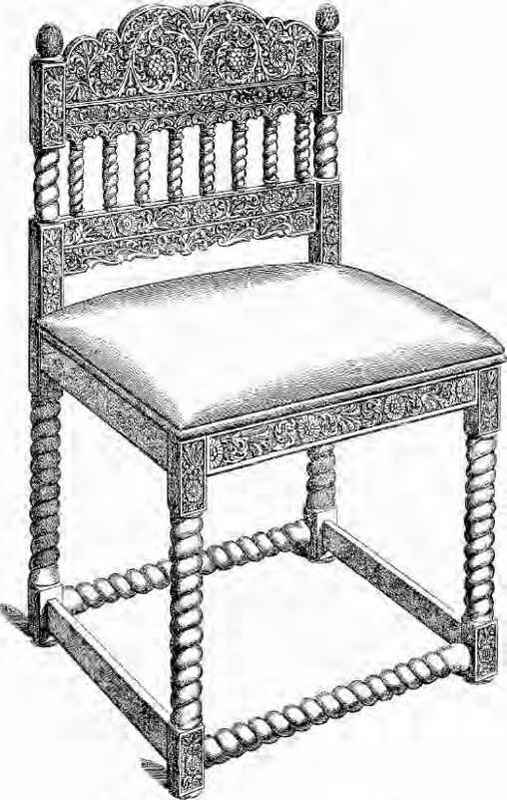 Later, as the heavy Georgian style predominated, there is the stiff ungainly gilt furniture, console tables with legs ornamented with the Greek key pattern badly applied, and finally, as the French school of design influenced our carvers, an improvement may be noticed in the tables and torchères, which but for being a trifle clumsy, might pass for the work of French craftsmen of the same time. The State chairs, the bedstead, and some stools, which are said to have belonged to Queen Caroline, are further examples of the adoption of French fashion. Nearly all writers on the subject of furniture and woodwork are agreed in considering that the earlier part of the period discussed in this chapter, that is, the seventeenth century, is the best in the traditions of English work. As we have seen in noticing some of the earlier Jacobean examples already illustrated and described, it was a period marked by increased refinement of design through the abandonment of the more grotesque and often coarse work of Elizabethan carving, and by soundness of construction and thorough workmanship. Oak furniture made in England during the seventeenth century, is still a credit to the painstaking craftsmen of those days, and even upholstered furniture, like the couches and chairs at Knole, after more than 250 years' service, are fit for use. In the ninth and last chapter, which will deal with furniture of the present day, the methods of production which are now in practice will be noticed, and some comparison will be made which must be to the credit of the Jacobean period. In the foregoing chapters an attempt has been made to preserve, as far as possible, a certain continuity in the history of the subject matter of this work from the earliest times until after the Renaissance had been generally adopted in Europe. In this endeavour a greater amount of attention has been bestowed upon the furniture of a comparatively short period of English history than upon that of other countries, but it is hoped that this fault will be forgiven by English readers. 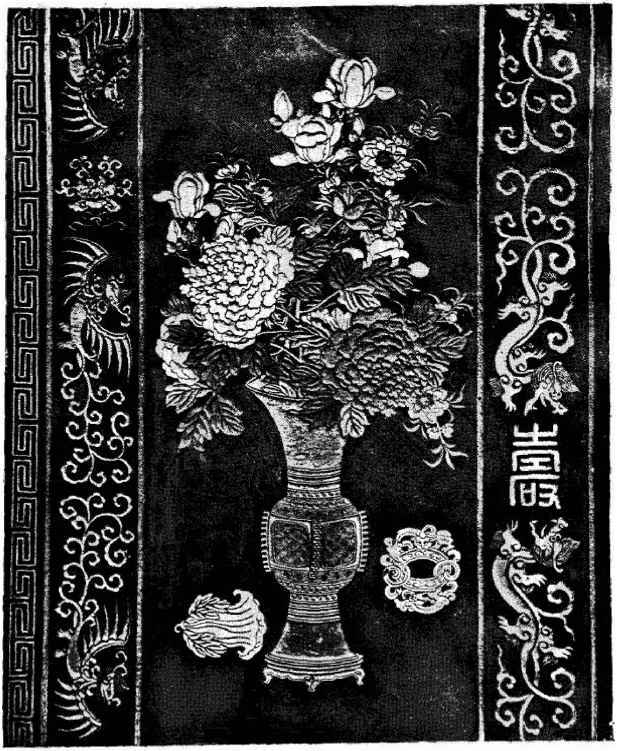 It has now become necessary to interrupt this plan, and before returning to the consideration of European design and work, to devote a short chapter to those branches of the Industrial Arts connected with furniture which flourished in China and Japan, in India, Persia, and Arabia, at a time anterior and subsequent to the Renaissance period in Europe.